Wind and warmer weather underlines the threat of wildfire for the rest of October. This month is usually the worst, but if warming conditions prevail, “wildfire risk could rise again before winter rains arrive in earnest,” says Weatherwest.com. Preparing for wildfire is a combination of prevention (a longer-term solution) and short-term preparation. Below are four essential short-term actions you can take now. They will minimize the risk to you and your home. I have first-hand knowledge of wildfire preparation and prevention. Living in a North Bay community designated as “at risk” for wildfire, I am well versed in both prevention and preparation. The unnerving “Red Flag” warnings from Nixle (learn about them below) reminds us to stay focused on safety. We are a proactive group. And, so far, we’ve been fortunate. Following FireSafe Marin guidelines, our neighborhood works together trimming trees, scheduling fire department consultations and following their recommended activities. This coming weekend is our second “chipper day.” Funded by a grant, our Fire Department will send out a chipper and crew to dispose of the trimmings from cut trees and shrubs. Hand-made signs posted throughout our neighborhood are friendly reminders for taking action. I believe that what has made us successful (the secret ingredient) is teamwork. Working together with a common goal of fighting danger. As a group we’ve been more effective than as individuals. The four activities below are the essentials of what you can do now. There is also an evacuation checklist you can use. If you haven’t already, sign up now. It will alert you to any emergency events and evacuations in your area. You will also receive non-emergency alerts about local criminal activity. Those messages can be annoying, but trust me, Nixle is an invaluable system. This link from ABC7 news will direct you to where and how to sign up for your county. Your county may give you options, i.e., text, phone or VOIP, on how messages may be received. Evacuation order: Means evacuate now do not delay to gather belongings. Fire expected in less than an hour. Evacuation warning: Evacuate soon, but there is time to gather belongings quickly. Shelter in place: It is safer to stay in your current location. Know your neighborhood escape route. Work with family and neighbors if applicable. Make copies of important documents like passports, insurance policies, birth certificates. Then put them in a safe deposit box. Fire Department Risk Assessment Request a visit your local Fire Department representative for a free vegetation management inspection. *This list was adapted from FireSafe Marin. They also have a comprehensive checklist. 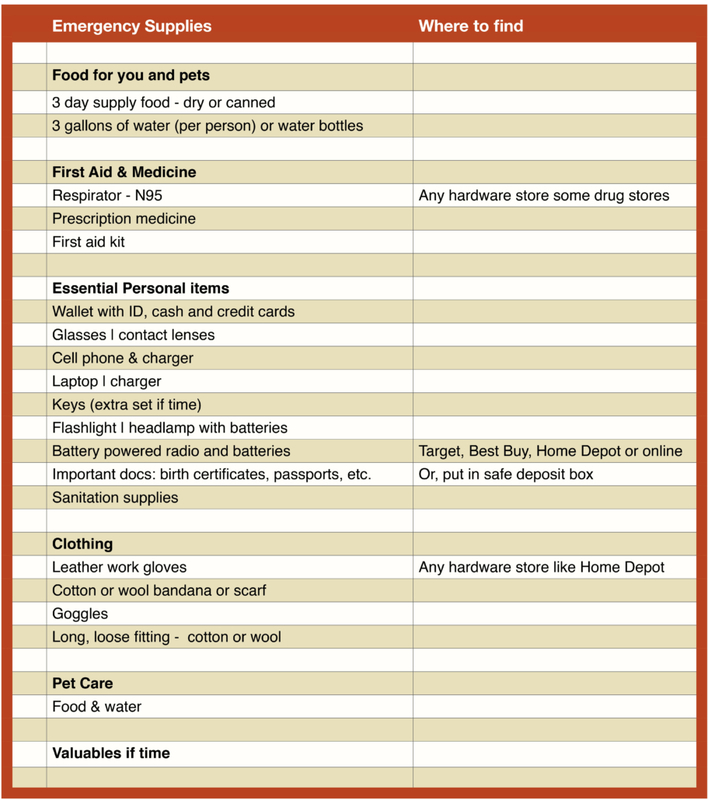 If you are looking for reviews and advice on where to purchase disaster supplies, the list below can help. Wirecutter, which is a New York Times Company has much information about where to purchase, costs and what is in pre-assembled kits. Aside from the above, there are local big box stores where you can purchase emergency supplies. Get dry leaves off your roof! Remove all dead plants, grass, and leaves. Remove dead dry leaves; pine needles from rain gutters and roof. Remove tree branches from your chimney, and the ones that are hanging over your roof. Cut or mow grass to a maximum height of 4 inches. Create horizontal space between shrubs and trees. Create vertical spacing between shrubs and trees. Mow grass before 10 am. A string trimmer is safer for clearing vegetation than a mower. Never on Red Flag days or when it is windy, hot and dry. Spark arrestors* should be installed on all portable, gas-powered equipment. *A spark arrestor prevents the emission of flammable debris. Our community’s “at risk” status didn’t register when I bought my house nine years ago. The only inkling about our prospects was a faded road sign that said “Keep up Your Fire Safety Efforts” and a neighbor’s stray comment that we “have fire drills every other year or so”. Then came October 2017. The Napa fire. Santa Rosa. And, a couple of terrifyingly close-call fires on Highway 37. A harbinger of summers to follow. I felt scared; powerless over the whims of a warming climate. Then I discovered working with my neighbors. Planning and talking about solutions to minimize risk, as a group, changed my perception of the potential dangers. Though I have no control over climate conditions, I feel safer now. Ultimately, battling Mother Nature as a team made a difference.